The Wright Aeronautical Corporation traces its history to the 1909 Wright Company of Dayton, Ohio, founded by aviation pioneers Orville and Wilbur Wright. In 1916, their company merged with Glen L. Martin leading to the formation of the Wright-Martin Aircraft Corporation, and their relocation to New Jersey. The New Brunswick plant manufactured the Hispano-Suiza, a liquid cooled aircraft engine used during World War I. After the war, the company reorganized as the Wright Aeronautical Corporation and moved its headquarters to Paterson, New Jersey, in 1919. The company’s future was secured when it purchased the Lawrance Aero Engine Company. Charles Lawrance and his team were successful in building a nine cylinder air-cooled radial engine, J-1, for the U.S. Navy. However, the Navy was concerned that they could not meet production requirements and recommended that they partner with Wrights. Wrights acquire the company in 1923, and appointed Lawrance as Vice President. 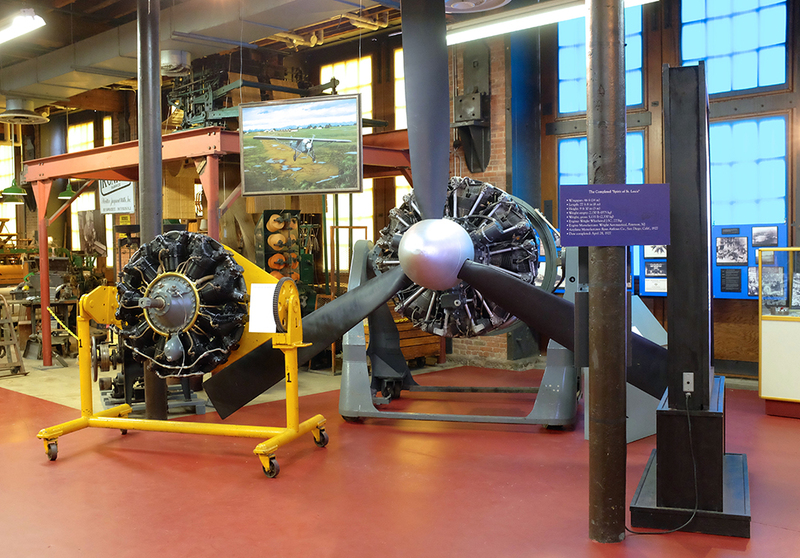 Together, they would produce the engines that powered the Golden Age of Aviation. Further development of the air-cooled engine design culminated in the Whirlwind J-5 that powered the Spirit of St. Louis from New York to Paris in 1927. From Lindbergh, Byrd, Chamberlain to Earhart, Wrights engines powered most of the 1920s and 30s historic flights. In 1929, the successes and competition among the pioneers of the aviation industry, resulted in the greatest aviation merger of its day. Twelve Wright and Glenn Curtiss affiliated companies united to form Curtiss-Wright. During the Second World War, Wrights played a major part in the war effort. The plants in and around Paterson produced over 142,000 aircraft engines. Wrights engines served in every theater of World War. During the war these engines were used in the Boeing B-17 Flying Fortress and the B-25 Mitchell. After the war, they found their way into DC-3 for commercial airlines worldwide.